Drop-in classes and yoga now available! $25 per class. Special $10 introductory rate for yoga classes. Please register to reserve your spot in class, as we limit all classes to just 10 people to give you our very best instruction. We teach proven methods to get fast results with building strength and burning fat. Our small group kettlebell and fitness classes are efficient because we combine strength and cardio conditioning in every training session. 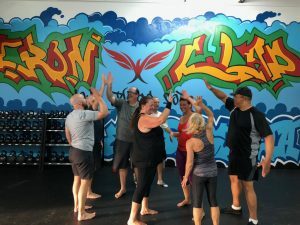 We emphasize proper technique on every exercise so that people of all ages, shapes, sizes and fitness levels can train safely in our classes. We provide hands-on training at all times. We teach you how to safely and effectively use kettlebells, TRX Suspension Training, battling ropes and your own body to reach your health and fitness goals. Our instructors must hold a current certification to ensure your safety. We keep our classes small – 10 people or less – so you get a more personalized workout experience. Our trainers and our students are friendly, fun and welcoming. We foster a sense of community and belonging; you’ll never be just a face in the crowd. Ask about our 100% money-back guarantee. Generous referral bonuses when you refer a friend! We have a range of memberships to choose from, along with drop-in classes. Please schedule a consultation to determine which membership is best for your needs and goals, or visit us for a drop-in class to give us a try first.